Motherhood has hands down been the most challenging and rewarding experience for me. The saying being a mom is the hardest job in the world, well, that's an understatement. I shared before about how I'm learning to be happy in the now and goals that every mom should have for herself. Some days I am really good at following through with this and others I find myself falling back into wishing for better days. We're all human, right? And just like I shared before about giving our selves grace, sometimes I need to go back and take my own advice. As much as I think the snow is really pretty and I enjoy going out and playing with my boys, it's also my least favorite time of year. I'm not one to wish time away, but I also can't pretend that I'm not happy it's now March. It's funny because seasons in other areas can mean something so different for someone else. I know there are those that love the winter because they experience such brutal summers. Weather aside, and even motherhood aside, we can all look to appreciate the small moments. I challenged myself to look back at the last month and think about the everyday moments that have meant the most to me in this season. Sometimes we get so focused on those big milestones, like taking first steps, first words, or learning to go to the bathroom. There's also those small moments or things that happen everyday that become part of our routine and can often be overlooked because they become the norm. I want to remember those too and the in between random happenings. 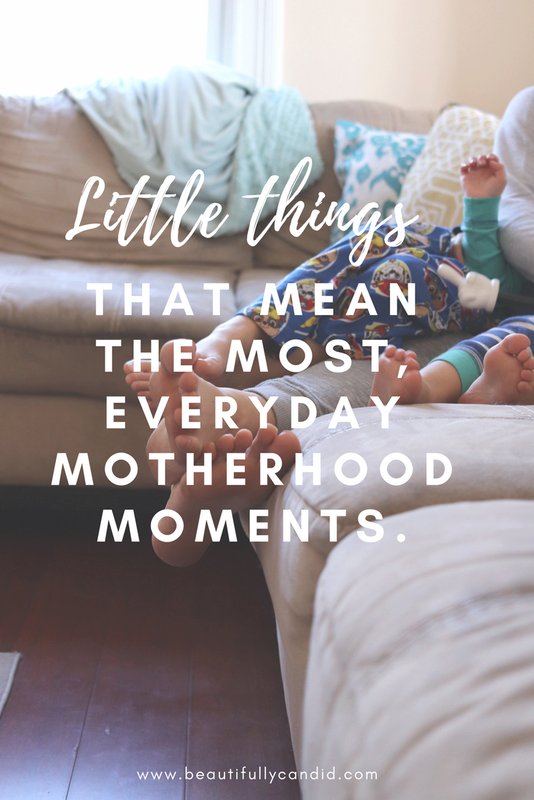 Here are some of our little moments that have meant the most to me. As much as I am not a morning person, I think it's so cute that little nugget will not get out of his bed until Eric or I go in and get him. We took the rails off of his crib months ago and converted it into a big boy bed but he still stays in there like he can't get out. I also love when A opens our door in the morning, even if it's before our alarm goes off, and climbs into bed to snuggle with us. Speaking of snuggles, there is something so nice about the colder nights and curling up in a blanket and the boys wanting to get under with us. I also love laying around with both of my boys in my lap listening to the sound of a crackling fire and watching the flames dance. I think it's so cute too when they want to get their sleeping bags out to have a camp out by the fireplace. I am extremely blessed that little nugget has basically been potty training since 22 months. As much as it takes away from other things I could be doing (you know, like three loads of laundry, packing lunches, unloading the dishwasher) some of my favorite moments are when he tells me to sit down on the bathroom floor and starts chatting it up about life and hearing his silly stories while he's doing his business. Our dance parties will always be a favorite of mine, but recently car dance parties have become a thing with us. They love the song Thunder, and when it comes on we are all dancing away. I can only imagine what someone is thinking when they pull up next to us at a red light. This is probably going to sound so weird but wiping noses. Yup, wiping noses. Ok, maybe not all of the stuff that comes out of it, because ew, but both of my boys are too cute when it comes to taking care of this. A makes this sniffling noise that is too funny and little nugget blows out of his mouth instead of out of his nose. Hiding has been a big thing with them and convenient enough it seems to happen a lot more right around bedtime. Eric and I always get a kick out of their hiding spots because they will be under the covers with half of their head sticking out, a foot peeking out down by the bottom, and a little voice calling out saying, come and find me. It's so cute that in their little minds they think we really can't see them. One of my favorite things has been watching the boys becomes so close with our dog. Every night A has coaty come up into his room and lay in bed with him. He'll use him like a pillow and our dog just sits there and loves every moment of it, or the dog will start licking him like crazy and want to play. The boys have also included him in their playtime and will pretend he's a dragon if they're playing knights or that he's a dinosaur coming to stomp down their forest. I know a lot of times we'll make reference or all say it's the little things in life, and I truly believe that. It's these little moments that make up the really big ones and all the in between. Sometimes we just need a reminder and to look back and actually appreciate them.